MenaQ7 is featured in quality products around the globe. Copyright © 2015 MenaQ7. All Rights Reserved. 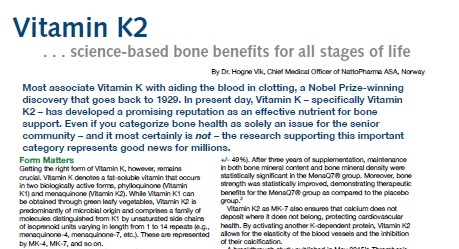 MenaQ7 Vitamin K2 is a trademark of NattoPharma ASA. The statements on this web site have not been approved by the Food & Drug Administration. Our products are not intended to prevent, cure, treat, or diagnose any disease. Absolutely none of the statements on this web site should be construed as medical advice. We recommend all people consult a licensed health care professional before starting any dietary or exercise program.